Some of you may recall that I posted a pair of post apocalyptic Sprites a few weeks ago- Willow and Shirou. Around the same time I drew them, which was around the same time I rewatched Mad Max: Fury Road, I ended up drawing this set of clothing as well. I decided to wait a little while to post it, because really, how much post-apocalyptic fashion is too much? There may not be a good answer to that question, I confess. While I do enjoy the post apocalyptic stuff, I find the color schemes are often intensely limited. Things tend to be army green, camo colors and khaki. For this set, I really wanted to embrace the colors of the desert, so I chose a light teal, purple-brown and a oxblood red. The teal reminded me of succulents and the purple-brown of rocks. 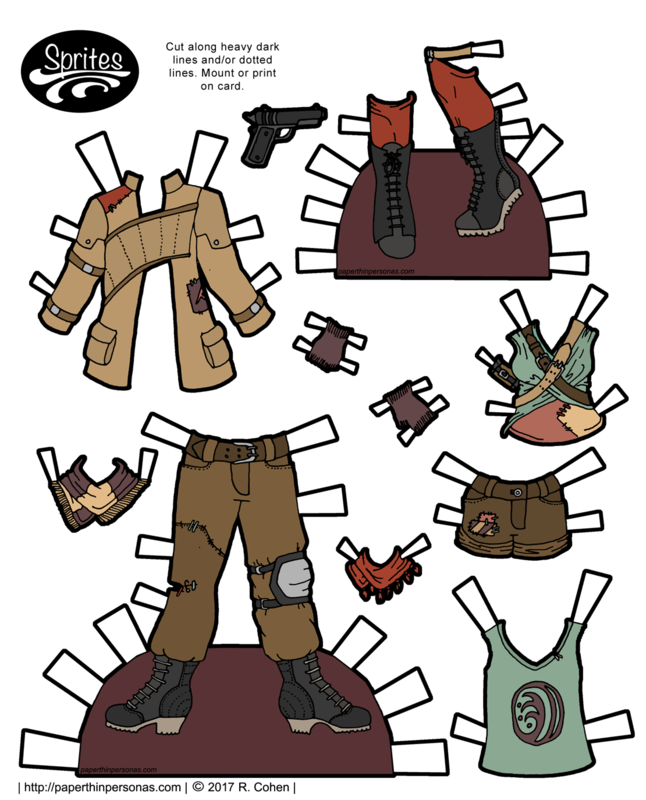 Along wit Mad Max: Fury Road, which inspired a round of sketching for post-apocalyptic paper doll attire, I also used my own Post-Apocalyptic pinterest board for inspiration. While I have doubts about the practicality of most of this clothing, I think we all can agree that practicality is never the hallmark of my paper doll creations. As always, let me know what you think in a comment and have a great day! I like the coat, it amuses me.